Hi there I'm trying to setup my Launchcontrol XL with Axoloti and I'm not getting the Led feedback via midi. I want to have visual Feedback on the knobs. So I programmed them to certain midi notes, and send out the corresponding notes out of Axoloti into the Launchcontrol. This does not work. I checked If the Axoloti actually sends out the notes via Ableton. It does send the right notes and the right velocities. I then recorded the notes sent into Ableton and send them into the Launchcontrol via Ableton. This worked, the corresponding pads lighted up. I also send midi notes out of Axoloti into my Nanokontrol 2 and this did work as well. The Launchcontrol is set to low power mode and I also tried everything with and external DC Adapter. Any suggestions what the problem might be? does the launchcontrol have more than one midi port? if so, try changing the midi port on the output object to something else , in particular try 1 and 2.
btw, you could post the console output from when Axoloti starts when the launch control is connected. I think the Launchcontrol only has one port, at least that's what I see in Ableton. In Axoloti there are four Axoloti Host ports that I can select and I've tried them all. Axoloti says: Address (#1) assigned. Axoloti says: This device has only 1 configuration. Axoloti says: Default configuration set. Axoloti says: MID class started. Oh yeah Midi Input of the controller works perfectly. I'll have a prod at my Launchpad Pro shortly, I'm guessing they behave much the same for feedback. Hmm I think the Launchpad Pro is a little bit more complex and it offers more options such as Din Midi for example. But let me know how it is going with it! Yeah I am seeing that, either way it should be on host port 1. You are sending trig as well as note? I have the LP lightshow going now with note, velo and trig all hooked up. There was some stuff on the (frankly useless) Novation forum about the buttons not acting the same way as the knobs and sliders regarding feedback. Novation themselves recommend sysex control as per the programmers reference. We do not have any sysex objects yet do we? I'm sending trig note and velocity. It worked with nanokontrol also on host port 1. I think axoloti has no sysex abilty at the moment. The weird thing is I got the light show from Ableton with notes that I recorded from axoloti. P.S. Im also using the launchcontrol in traktor with led feedback working perfectely. When you send midi from the axoloti to the launchcontrol, is that via your PC? Or are you using the axeloti usb host port? There might be some non standrad usb driver installed on your pc which the axoloti obviously does not have. Launch Control XL uses a System Exclusive protocol to update the state of any button on any template, regardless of the currently selected template. In order to maintain compatibility with Launchpad and Launchpad S, Launch Control XL also adheres to the traditional Launchpad LED lighting protocol via note-on, note-off and CC messages. However, such messages will only be acted upon if the currently selected template contains a button/pot whose note/CC value and MIDI channel match those of the incoming message. Users are therefore advised to adopt the new System Exclusive protocol. Launch Control XL also adheres to the traditional Launchpad LED lighting protocol via note-on, note-off and CC messages. However, such messages will only be acted upon if the currently selected template contains a button/pot whose note/CC value and MIDI channel match those of the incoming message. so Id do some tests by sending lots of different values, just in case the template is not mapped as you expect. Hmm but I mapped the Template myself with the Launchcontrol Editor. However, such messages will only be acted upon if the currently selected template contains a button/pot whose note/CC value and MIDI channel match those of the incoming message. And I made sure that the notes I am sending are matching with the notes I mapped in the Template. I tested with dials hooked up to pitch out of the midi out object, so I've skipping through all the midi notes. The only Thing I could try is how this thing reacts if I map the buttons to CCs instead of Notes. I just checked with midi CC, it's the same story. If i send Midi out of Axoloti via Ableton into the Launchcontrol, LEDs are lighting up, if I go directly out of Axoloti into Launchcontrol there is no reaction. Live MIDI remote script is probably handling the LEDs in that case? No Live is just Acting as a transmitter of midi data from Axoloti to the Launchcontrol in order to test If I have Axoloti's output and the pads I want to enlighten (haha) accordingly. Odd, have you tried with a MIDI monitor like MIDIOX or equivalent instead? yeah, it was a long shot... but sometimes the simple things are the things that trip us up. its a bit odd, if your receiving data, then its obviously connected. I've checked the LCXL programmers guide, and it says it only has one port, so if its connected for input, then there is no reason output should not work. when we send data, we basically send 5 things (e.g. 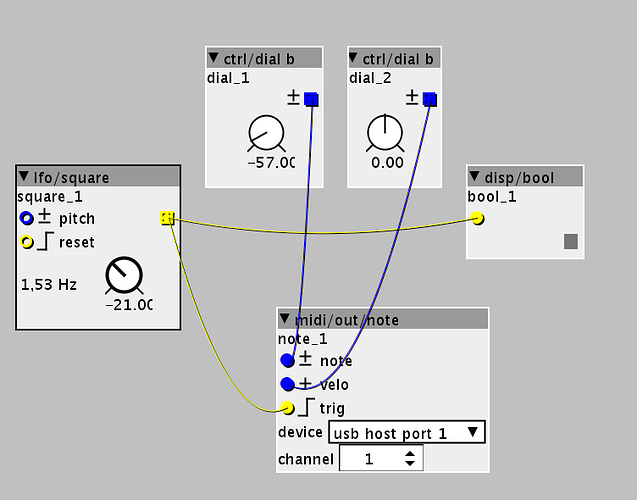 note on), midi port, midi channel, note on, note number and velocity. given we do this the same for all devices, and it works, Im confident our 'format' is correct. the only thing I can think of at the moment, is trying to send lots of different data to it, to see if anything reacts, if it does, that might give us a clue as to what is happening, and what the LCXL is filtering, or more importantly not. That's not a good thing right? Oh when I set the Lfo really low there is no Overflow...but when I start twaking things the overflow comes again. Update: I have to be really careful with how much I send. I get this Overflow message quite quickly. Once it is there it comes all the time. The only way of getting back to normal is disconnecting the controller unpluging axoloti, reconnecting and then reconnecting the controller. yeah it will overflow if you send faster than it can get the data to the connected device. we have to buffer the messages to send out, and we can obviously only buffer so much, as it take memory. send the data slowly, what you want to do is just send every note at a constant velocity, and every CC with a set value (both according to what you know is a visible colour) , then just see if anything lights up, as long as you don't send a note off, then it doesnt matter how long it takes to run. I just fed it values manually, really slow and it still got the buffer overrun on all four ports. How can I send notes without the note off?